Response to our special June offer was so good, we've decided to double down for July. Now you can get your island visit on for even less. Put yourself in the picture with gentle green sea turtles like the one in this video for a limited time only for 7 percent off the published rate for this quiet, and already reasonably priced oceanfront condo at Kona Isle. This offer is valid (and void where prohibited) if you book your stay from July through Sept. 27, 2013. This special offer, the last of the summer, must cover a booking reserved now through July 10. No travel agent commissions on this low, low price, applies only to a paid in full good cash, check, gold bullion or any other form of booking payment that does not result credit card charges to the owners. Please mention this offer to Nick, our most courteous and industrious manager at Knudson & Associates in order to qualify. We recommend Hawaiian Airlines for your flights, but off course, you are free to travel to the most geographically diverse of all the Hawaiian Islands via any method you choose -- kayak, swimfins, advanced time travel machines. If Kona Isle isn't your cup of tea, you can find plenty more offerings to choose from courtesy of our highly recommended management company Knutson & Associates. Aloha. p.s. and by the way, the video above was shot with a simple Flip video camera, which proves you do not have to be an advanced professional to return home with a memory that lasts a lifetime. Also, for you people who cannot stand to be disconnected (and you know who you are) there's a private wifi network just for you. Above: Flatworm hangs out underneath the ocean off the Big Island. We're often asked how the weather treats us while we're on the Big Island. In a word: wonderfully. Take a look at the views from OurKonaCondo.com (specifically Kona Isle D-21 now skillfully managed by Knutson & Associates) to see what we mean. "There are really only two seasons: the summer months that extend from May to October and the winter months that run from November to April. The average daytime summer temperature at sea level is 85 degrees F. (29.4 C), while the average daytime winter temperature is 78 degrees (25.6 C). Temperatures at night are approximately 10 degrees F. lower. However, at higher elevations, temperatures can drop dramatically." The Big Island, for the uninitiated, is much different than the other Hawaiian islands, in that it contains one of the world's most diverse collection of microclimates on a single island. Because of the isle geography, one could conceivably experience humid sub-tropical ocean temperatures in the morning on any west-facing beach and near Antarctic conditions at night near the top of Mauna Kea. Depends upon how much running around you want to do while here, bruddah. From the University of Hawaii-managed Web site, Pacific Disaster Center, we learn that the trade winds account for 70 percent of all the winds in Hawaii (rumor is Talking Story accounts for a significant other proportion;*). The off-the-record skinny on the weather in the fall is "depends." If the traditional trade winds take a break, there goes your ocean breeze. Which is okay too, the ocean is nearby to cool you off. In the space of a few minutes, where else can one view a stone's throw from shore, numerous green sea turtles, the state fish the humuhumunu, etc., schools of ravenous convict tang and scores of others but Kahalu'u? Oh, there are most likely a few, but not many within minutes of OurKonaCondo. Speaking of which, stay tuned for some exciting news from these parts and in the meantime, please enjoy these snaps of our fellow Earth beings. What are you looking at, fishface? Hey everybody, wait for me. Guys! Wait up!. Swimming with the spinner dolphins with Jack's Diving Locker off the leeward side of the Big Island. This was in the bluish water just off a dive site the locals call Golden Arches, but they can be sighted just about anywhere of the Kona coast, including from the lanai of Kona Isle D21. We had just wrapped up our first dive of the morning, when one of the excellent dive guides pointed about a mile away and said they were en route. All we had to do was snorkel out to them a few hundred yards straight off the dive boat's bow, and let them swim past. They didn't stick around. They were on a mission. Or, maybe they knew better than to hang around a bunch of peoplefolk, knowing how much trouble we can be. It took much kicking and thrashing just to get this close before they sped past, paying us no never mind. Most times, if an ocean critter chooses not to swim with you, it's up to them. Marine Wildlife Seasons....Whales, Dolphins, and MORE!! There we were, about to attempt the dismount at Pu'uhonau o Honaunau, aka, The Place of Refuge, aka "Two Step" -- it can be quite tricky sometimes, so, were were trying to pay attention...when something unusual in the shallows caught our eye. 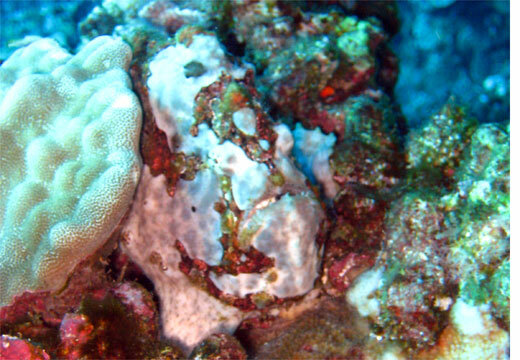 Yon little crusty, scyllarides squammosus, remained stock still, trying to blend in with surrounding coral. Hmmm...you tell us...was he doing a good job? "The commercial lobster fishery in Hawaii is a limited-entry trap fishery that harvests said slipper lobster species in the Northwestern Hawaiian Islands (NWHI). The Northwestern Hawaiian Islands are an isolated range of islands, islets, banks, and reefs which extend 1,500 nmi northwest of the main Hawaiian islands from Nihoa Island to Kure Atoll." Guess also, it's legal to take 'em around these parts, if: they are in season, (Sept. 1-April 31) at least 2-3/4 inches in tail width), and that certain permits may be required -- heck if we can figure out which -- and, since we like enjoying our sea life in the ocean (and thus, cannot eat "familiar" lobster), we won't spend much more time or space on it. Oh me oh my oh. Where does the time go? The good folks at our favorite Kona dive shop have set their annual sale, and if you're on island, be sure to check it out. You also have plenty of time to plan ahead, grab a flight out, and stay at our humble little abode, as it's on Saturday, August 19th. We receive late word from the folks at Jack's Diving Locker, which we've previously cited in this space here as among the top-notch dive shops on the Big Island. They say there are still a few spots left on their dive boat in advance of the 7th annual Kona Classic. Budding shooters and those hoping to hone their skills further have a number of options (and, of course, you can always plan for next year. 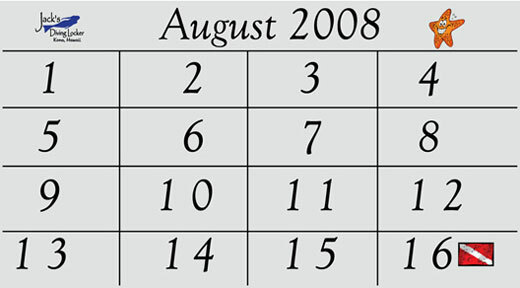 Options for the event include merely attending the daily seminars by the photo pros, participating in the contents by book your own dives or those by shore. And of course, if you are "mondo", you can still get into the "whole Enchilada." Check on their site for more info. Okay, pay attention now, this is very important, because the next few words here in the Kona Isle C31 Kona Condo blog could change your life. This here is the Commerson's Frogfish, which we were guided to by our very fine diving friends at Hawaiian Rafting Adventures off Lanai. Good thing we had Capt. Steve Juarez on the dive to point it out for us, because these little critters are well camouflaged as you can see. Some of the science stuff here we attribute it to a cool web site called Tree of Life. "Frogfishes of the family Antennariidae are typically small, globose anglerfishes easily distinguished from members of allied families by the presence of three well-developed dorsal spines, laterally directed eyes, a large, anterodorsally directed mouth, and a short, laterally compressed body (Pietsch, 1981). They share with other families of the teleost order Lophiiformes a peculiar and unique mode of feeding that is characterized most strikingly by the structure of the first dorsal spine, which is placed out on the tip of the snout and modified to serve as a luring apparatus." What does all this have to do with our Kona Condo? Well, it's this, again, attributing to TOL. It seems that frogfishies such as these "spend the greater part of their lives squatting on the bottom." Now we ask you, is this any way to live? They are rather sedentary, and hence, this attributes to their portly, if not somewhat rotund appearances. Now it doesn't take a rocket scientist (or even a marine biologist( to see that the only thing a frogfish is going to interest in this world, is another frogfish. (Unless you believe in fairy tales, which we do not). Or, they're also equipped with a luring appendage. If a terribly nearsighted fishie gets too close will will be unceremoniously sucked into a hungry frogfishie's mouth via a very efficient vacuum-like method. So, you there, stuffed into your rapidly shrinking cubicle looking at your rapidly expanding waistline, book some time soon to visit Kona, stay and play, scuba, swim, snorkel, whatever, and shake yourself loose from the Frogfish doldrums. Guaranteed, the experience will change your life.